It's a relief to be able to think of Jim Jarmusch fondly again. As unfair as it is to judge a director I like harshly by one movie, I couldn't get the bitter taste of Limits of Control out of my mouth for a long time, and it inexplicably tainted his earlier films, many of which I really enjoy. For five years, it lingered, festering and rotting, annoying me with an "art-y for its own sake" construction, and I suddenly didn't feel like watching Ghost Dog or Down by Law. There's no "there" there in Limits of Control - the film is strictly an exercise of the director drawing attention to how clever his ideas are, with no characters or narrative to draw from. A lack of narrative isn't especially new for Jarmusch - in fact, it's usually a selling point. But lack of characters? Can you imagine Dead Man without the oddball supporting cast to balance out Johnny Depp? Coffee and Cigarettes at all? Thankfully, five years later, Jim Jarmusch returns to characters, and from a most unlikely (for him) literary source: vampires. But I wasn't worried. I can't explain why, but despite the fact that we've been seeing watered down bloodsuckers for the last half decade (or more), something about the idea of Jarmusch and vampires felt right. It was a gamble that paid off, because Only Lovers Left Alive is easily his best film since Ghost Dog and completely wipes Limits of Control off the ledger. Everything that fans have come to expect from Jarmusch is in there: the aimless story, the location as musical backdrop, the off-kilter humor, and most importantly, memorable characters. When we meet Eve (Tilda Swinton) and Adam (Tom Hiddleston), we don't know anything about them other than they abide messy abodes. The camera hovers above them, spinning like a 45 as Jarmusch makes his way to their faces, the soundtrack booming. If you haven't seen the trailer, I suppose there's a good chance you wouldn't know they were vampires, at least until Eve leaves her apartment in Tangier to visit a night café. She's waiting patiently for an old friend (John Hurt), and when she says his name, Christopher Marlowe, I guess the jig is up for people going in blind. Yes, that would be "the" Christopher Marlowe, and yes, he's a vampire. He has a nice supply of "the good stuff" that he's happy to share with Eve, but please don't say his name out loud. Just writing this, I feel like I'm making Only Lovers Left Alive out to be a very obvious and stupid sounding movie, which it isn't. Jarmusch doesn't play coy about Adam and Eve* - they are vampires, they are old, and there's a lot of unspoken history between them. Taken out of the context of the movie, I could understand how it might sound clever in a bad way, but it's presented so matter-of-factly in the story that it's hard not to take in stride. Eve is so easygoing, and Adam so morose, that you worry they're just going to be "types," but then Jarmusch brings them together and Only Lovers Left Alive shifts into a love story. Marlowe asks Eve why she and Adam don't live together if they've been married as long as they have been, but it seems pretty clear when she leaves Tangier to visit him in the U.S. that they have a long history together. They can be together and apart, and Jarmusch doesn't give any explicit reason why they're comfortable half a world away. There's no tragedy or disagreement hanging over the narrative - it just is, and you accept it the same way you do the conceit that they're vampires. Like many Jarmusch films, the why is less important. It gets in the way of what is. 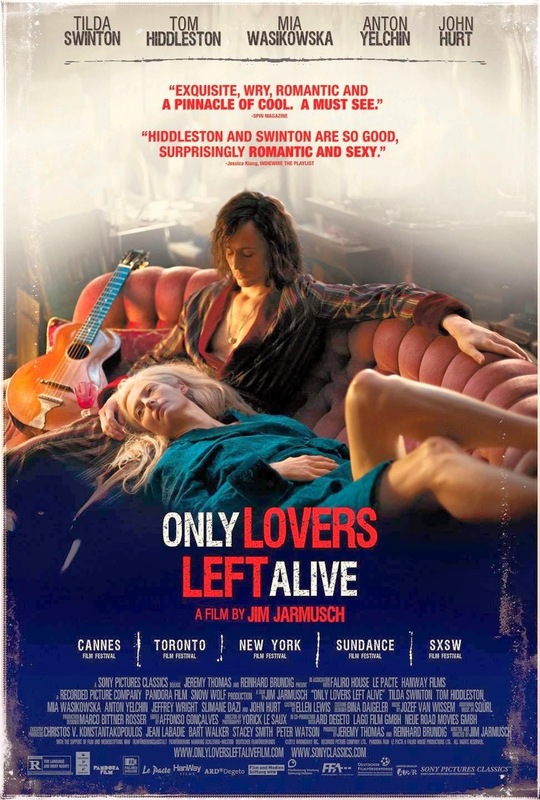 As he has in the past, Jarmusch sets Only Lovers Left Alive in a city known for its musical history. In this instance, it's Detroit, where Adam sets up shop in an abandoned part of town (the city's current financial calamity is another critical part of the story) and makes music in anonymity. At least, relative anonymity. He has Ian (Anton Yelchin) bring him recording equipment, instruments and, in one special request, a bullet made of wood. That doesn't amount to much more than a MacGuffin, but it's behind what brings Eve back to Adam. He's sick of the "zombies" (what vampires call humans) and is irritated that his music is finding an audience, despite his efforts to mask his identity. She brings him solace, and when the two of them come together, their facades crumble at bit. It turns out that Adam is also something of an amateur scientist and mechanic, who sets up his own sustainable energy for the house and who tinkers with old equipment. During a Skype (?) chat, he transfers the laptop signal to an old television. It's something he enjoys doing. Most of the time they drive around Detroit, and he takes her to the Detroit Theater (now a parking lot) and offers to show her the Motown Museum ("I'm more of a Staxx girl," she professes), but Eve is awfully impressed when Adam pulls up in front of Jack White's childhood home. If there's a singularly Jim Jarmusch-y moment in the film, that has to be it, but fans of Mystery Train should enjoy the thematic bridge. Their reunion is short lived, because dreams involving Eve's sister, Ava (Mia Wasikowska) turn out to be her way of announcing a visit. Ava doesn't care much about protocol like entering a home without permission and doesn't care much about personal space - she's more than happy to tear through Adam's supply of blood. She's not a very welcome guest, by either of them. It's hinted that they haven't seen her in more than a hundred years, and that it didn't end well "in Paris," and she doesn't seem to have changed much. Lest you worry that things get to dour and "goth" with vampires in the picture, you needn't worry: Only Lovers Left Alive is frequently very funny, in an off-beat way. Much of it comes from Adam's source for blood in Detroit, played by Jeffrey Wright. I'd tell you his name, but the setup and payoff of his name tag and the one Adam is wearing is too good to spoil here. When Adam needs blood, he pulls his scraggly black hair back into a ponytail, puts on scrubs, a stethoscope, and walks into the local hospital. The other doctors give him an askew glance, but don't say anything. However, in order to maintain a sense of mystery, Adam puts on his sunglasses when he walks into the blood lab, and he looks ridiculous. Jarmusch holds on the image of Adam trying to look intimidating as if to say, "dude, who are you kidding?" and Wright's character reacts accordingly. Yelchin and Wasikowska also provide varying degrees of comic relief, although Hiddleston gets most of the laughs as he tries to humor Eve and handle Ava with anything more than exasperation. His carefully constructed persona collapses completely with his wife and sister-in-law dragging him to a club, and Hiddleston knows exactly when to play the laugh. It would be easy to say he's simply playing a variation on Loki in Only Lovers Left Alive, but I don't think that's quite the case. Adam is more a creature of habit than Loki is, more comfortable in his carefully controlled environment. By the end of the film that environment has been completely shattered, and there's a humorous inevitability to the final shot. Swinton plays the moment perfectly, but that's consistent with her performance in the entire film. As Eve, she carries herself with a natural ease at all times that Adam desperately wants to have. Watching her subtle facial shifts around Ava is also fascinating - Adam is disdainful, but Eve is cautious, nervous even. In all honestly, I could have spent another hour with Eve and Adam, but I'm happy to have what's there. Only Lovers Left Alive restores the character to the Jim Jarmusch character study, and you don't mind watching a movie where the main characters drive around Detroit or hang out on the couch most of the time. Really, it's a lot of fun. The soundtrack is great, the actors are having fun, and Jarmusch brings just the right balance of directorial flourish and musical fetishism to the proceedings that I'm having a hard time finding things to complain about. There are more bad vampire movies and shows out there than good ones, it often feels like, so it's nice to add another film to the "positive" category. If you want to see a vampire movie where nothing really happens that you'll enjoy, check out Only Lovers Left Alive. Unless you like sparkly things or need someone to say the word "vampire" every ten minutes. You won't find that here. * Jarmusch did not, apparently, intend for audiences to assumed they were "the" Adam and Eve, but the IMDB trivia page erroneously refers to them being based on Mark Twain's satirical excerpts from the "diaries" of Adam and Eve, which ARE about "that" Adam and Eve. Twain also appears as a photograph on the wall of acquaintances in Adam's apartment.